Too Soon To Cry “Victory” On Latvia? “Doom-mongers” – the Economist tells us – “are licking their wounds”. And why exactly are they licking their wounds? Well for two years now (apparently) they have been telling us that “the struggle to save the latâ€™s peg to the euro was bound to end in tears”. As you could imagine right in the very forefront of these so called doom-mongers is to be found yours very truly (and here), and of course Nobel Economist Paul Krugman (and here). But while I have never thought of myself as especially adverse to admitting defeat when faced with compelling reasons to do so, just why, we might ask ouselves, should we start to think about licking our wounds right now (and why our wounds, since it is poor old Latvia which has been subjected to all the blood-letting implied by this none-too-convincing “thought experiment” turned reality)? Well, in the first place, given the dramatic current account correction, Latvia’s outlook has been revised from negative to stable by Standard and Poor’s rating agency, which means – when you get down to the nitty gritty – that they don’t expect any further downward revisions in Latvia’s sovereign credit rating in the next six months. Standard & Poorâ€™s, a rating agency, has raised its outlook on Latviaâ€™s debt from negative to stable (ie, it no longer expects further downgrades). The current account, in deficit to the tune of 27% of GDP in late 2006, is in surplus. Exports are recovering. 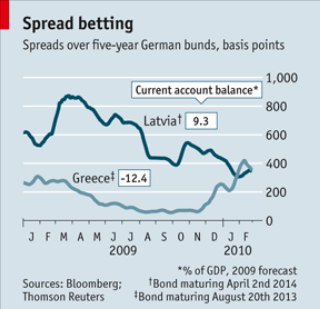 Interest rates have plunged and debt spreads over German bonds have narrowed (see chart). Fraught negotiations with the IMF and the European Union have kept a â‚¬7.5 billion ($10 billion) bail-out on track, in return for spending cuts and tax rises worth a tenth of GDP. And anyway, Latvia is not as bad as Greece. As evidence for just how much better Latvia is doing than Greece the Economist cite the movements in the respective bond spreads, and of course, the extra interest the Greek government has to pay to raise money (with respect to equivalent German bonds) is now marginally more than the extra interest Latvia has to pay, but then Greece has yet to go to the IMF. But just in case both these arguments seem rather like clutching at straws when compared to the “gravitas” of the situation, there is a “clincher”. something many thought impossible: an internal devaluation. This meant regaining competitiveness not by currency depreciation but by deep cuts in wages and public spending. In a recent discussion of Greece, JÃ¶rg Asmussen, a German minister, praised Latvia for its self-discipline”. Well, I’m sure that having a positive reference from a German minister in a discussion on Greece is a positive sign, but hang on a minute: just what internal devaluation is our author talking about here, and what deep cuts in wages and salaries? According to the latest available data from the Latvian Statistics Office, average wages in Latvia were down 10% in September 2009 over 2008, but since wages in September 2008 were up 6.5% over wages in September 2007, when the Latvian economy was already in deep trouble and wages and prices were already seriously out of line, then they have only actually fallen back some 4.15% over the two year period. I am sure these cuts are painful (a 20% unemployment rate, and young people emigrating is even more painful), but I would hardly call this a “deep cut” yet awhile. The thing to remember here is the difficult characterists imposed by the presence of a peg. Latvian real wages (when adjusted for inflation) may well have fallen more, but this is to no avail (and simply makes the internal consumption problem worse), since what matters are the Euro equivalent prices of Latvian wages and exports. This is one of the reasons why in these circumstances a peg is such a horrible thing. And if you’re still not very convinced, let’s try the Eurostat equivalent data for average hourly wage costs, which had in fact only fallen by 3.5% year on year in the third quarter of 2009. Why the difference between average wages and average hourly labour costs? Well, given the depth of the recession people are obviously earning less, since they are working less, but this doesn’t help overall competitiveness, since what matters here is the hourly cost of each unit of labour. I’m sorry if this is all fairly turgid economic data stuff (yawn, yawn, yawn) but if you want to cry victory, you really do need to check your facts a bit first. In fact, as I said in my last post, additional evidence from the consumer price index suggests the “internal devaluation” is only working at a hellishly slow pace. 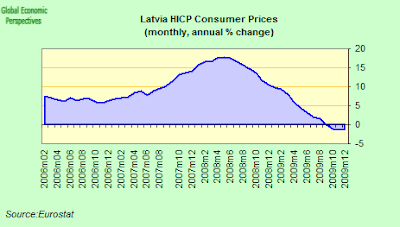 Prices were only down by 3.3% in January 2010 over January 2009 according to the latest HICP data from Eurostat. And while producer prices have fallen a little further – by 6.6% in January over January 2009 – there is still a long long way to go. 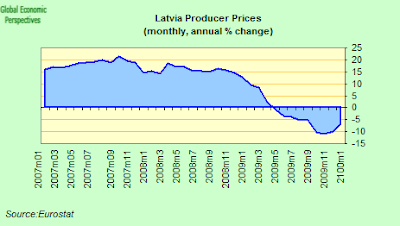 Basically there is no doubt that Latvia’s great economic fall may be coming to an end, but as I explained in this post here, that is not the same thing at all as resuming growth. To get back to growth Latvia’s internal devaluation needs to be driven hard enough and deep enough to generate a sufficient export surplus to drive headline economic growth at a sufficient speed to start creating jobs again. This is not about a fiscal adjustment, it never was, and it is little consolation for Latvia to be compared with Greece and told that they are doing just that little bit better. Cry Victory we are told, and unlease the jobs of war. Would that things were as easy done as said! In fact, Latvia is the major counterexample of internal devaluation. For the abnormal GDP fall of -18% the gain in PPI is only 6%. This hardly keeps at par the competitiviness with Germany with its wage cuts of 5%, and much lower loan costs, not to even speak about improvings. I agree with govs from Latvia that internal devaluation is little efficient while very painful. When we had financial crisis of our own in 1997, the CZK’s peg to DEM/USD basket was ended and the currency has been freely floating since then – which has worked very well. Of course, we had almost no foreign currency debt exposure back then. Let’s wait and see what the wage data for the fourth quarter shows. It is due next week. I suspect the cuts were deeper than they were in the third quarter, especially in the private sector. Also, the retail sales figures published today showed a rise for the first time since May 2008. That’s gotta mean something (I’m no economist by any imagination). As to return to the economic growth, the exports are picking up. The fact that even during the boom years Latvia had no real economy as such also contributes to the fact that the after crisis economic growth will be slow. This is why I think the real economic development will depend on policy choices the government will make in the next two years. The problem of economists is that they tend to look at the problems facing Latvia (Greece, Portugal, Spain and Italy) from a strict economic point of view. From that perspective de Latvian remedy is not very efficient. Unemployment is sky high, GDP falling, etc, for very little internal devaluation. It means that at the end of the day, the country is still not competitive. Obviously it is probably technically true. However, the value of the Latvian remedy is not only to restore competitiveness as to make sure that in the future the workers and the government will behave. That is, if you want to have a Deutschmark, sorry, a Euro, as a currency, you have to learn the discipline that goes with it. The southern countries wanted only the advantages and forgot about the cost for almost ten years. Well, they will learn about it and understand that rising salary is only possible with rising productivity. Germans value and have learned to live with a strong currency and this during decades. Collectively they know that a strong currency is important, a lesson they got from the crisis of 1929. Other countries can learn too. And if this lesson is learned with a Latvian type of medecine, well, there is hope. In sum, what we are witnessing here is a collective crash course of economics. Oooh, it’s spot the begged question time again. “Having” to learn something is not the same as learning it. Pingback: The new conservative meme: unemployment is awesome « Stocks Go Up. Stocks Go Down. This leads to a logical question. If internal devaluation does not work, what does this mean for the Eurozone? or is this kind of a pun I donÂ´t quite get? Even if there would be theoretically e some imaginary small increase of Latvia’s competitiviness due to extreme measures comparable with WWII, the real competitiviness will fall, because it is hard to understand what the positive effect of closing of 40% of schools and cutting 90% of money for research and development will bring in the nearest and especially further perspective. If a country’s GDP can fall by 17.5% in one year and that refutes the pessimists case, what would prove it? Speaking as a pessimist, the only thing that has surprised me is that Latvia has been willing to pay the price (so far) to keep the euro. If they continue to be willing to pay any price and bear any burden, I am sure that will keep the Euro. But somehow, I still doubt that they will be willing to pay any price to keep the euro. Even granting that Latvia manage an internal devaluation, that will only solve one problem (making exports more competitive) by creating another one (increasing the real cost of servicing external debt). People who are saying “hooray, the interest rates that Latvia has to pay is falling” while at the same time saying “hooray Latvia is managing an internal devaluation” should think a little bit about how those two things might be canceling each other out in real terms. I didn’t read the Economist article as being this stupid. Yes, by all means bash the Economist for trivializing -17.5% growth, and for being wrong on most of its economic statistics. But I thought the main point of the article is that unlike in Greece, in Latvia public institutions have not broken down as much. Latvia may be worse off economically, but Greece is worse off politically. By the standards of the Economist, the article isn’t that bad. Oliver, If internal devaluation does not work, what does this mean for the Eurozone? I think they should see the situation as if it were a single country. If it were needed devalue, they would have to devalue the euro. And they have to strenghten the EU fiscal policy; and we already have the example of the european funds. Truly, I do not see how internal devaluation could help. This is not a way to make a country more competitive, at least not by itself. And I think the proof is that we see countries that have to devalue periodically. Althoug I admit that at the moment was inevitable as the only way to pay. The only way it could work is atracting foreign investment. But I am not sure it will work very well. My opinion is that “internal devaluation” is a thing taht only should happen to the strictly neccessary extent (in order to continue economic activity), and no more. So it should not be forced. Moreover: I think that it is needed to rethink the monetary policy of the ECB. The ECB really focuses on inflation control. Maybe it would be better to focus on controlling the exchange rate and take inflation rather as an endogenous phenomenon or so. But of course, what’s far more likely (based on past international experience) is that as soon as a little bit of growth resumes, prices and wages will start to bounce back — quickly eliminating whatever competitive advantage has been gained through enduring a hellish recession. True, the same thing would probably happen if Latvia chose to break the peg, but at least it would then have the monetary tools to try to massage the trade off between devaluation and inflation. Then again, they could always just hire Goldman Sachs . . .
ed, what about productivity? can latvia increase output per worker to gain competitiveness ? i think this is also an option besides depreciation and deflation, isn’t it? especially for those countries that are far behind rich countries. now i understand this is not so easy to accomplish but nevertheless. if you have strong productivity growth than wages can be cut by less percentage. i would appreciate your toughts on this. Unless you increase productivity by firing less productive workers, it would take innovation or investment. More than a few percent a year are not realistic. And again if you doubt Latvia will stay with the peg, you’ll be reluctant to invest in case you want to get your capital out again. oliver, latvia (as well as other countries of eastern europe)is far behind west in productivity. so, i presume, there is a lot of space for improvement. by accelerating structural reforms. but than again, you can do that with depreciation as well. Well, I have to say that internal devaluation is not an alternative to increase productivity, and it has not similar effects per se. Depreciation is a mere de facto thing, it will happen anyway in relative terms, because of the economic situation. ok, but rise in productivity ( compared to trading partners) will make you more competitive, right? if wages rise but rise slower then productivity, nation becomes more competitive. i think that’s china’s story. paul krugman compared GDP deflator of spain and germany( we can include latvia) and you could see why is germany more competitive. but if he included china, conclusion would be wrong because china gained competitiveness despite rising prices( and wages. A nation is more competitive when its productivity grows, regardless of how wages evolve. That is rather secondary. And you know, the very same productivity is a limit to the amount of wages, so… there is always a limit. About Krugman: I think he is not entirely right. You have to think that Spain was growing at a greater rate, and spanish general prices were approaching to those of Germany, and inflation was higher…so it is normal that wages grew more. But even today general prices are higher in Germany. So things are more complex. And China is another world. I will clarify: playing that game, China is getting better. So they are doing well. If we play that game, we would get worse. Well, that is my opinion, unless a better criterion. Am I the only one that read The Economist’s article that Edward links on the first line? Because it says exactly the same things about Latvia as Edward does: it says literally that S&P rating means that it does not expect further down gradings; it says that the spread is still very wide; it says “Even if a catastrophe has been averted for the moment, Latviaâ€™s economy remains troubled.” Reading Edward one would think that they are saying something else, just because in the first paragraph it says that Doomsayers did not get it right, their predictions are still unfulfilled and the prospect does not point in that direction anymore as it was doing up to now. And who knows anyway how would Latvian economy be today if it’s peg with euro had been dropped two years ago, as recommended by those that should now be licking their wounds. Their debt, mostly in euros and swiss francs would have exploded. The possibility of joining the euro would have disappeared completely. The waves of their private defaults would have spread all around, and would have alienated any chance of ever again been financed by anyone west of Riga. But then again, all those things would have made for a very tasty article telling the world the consequences of not sticking to your compromises. Doomsayers always win. I mean, the UK has its own currency, not pegged to anyone’s else. They have lost ground with any other currency in the last three years, 25% with the euro, 40% with the yen, 20% against the dollar,… are they really in any better position than Japan, the U.S. or Europe? Really? Has their public debt improved? How is their growth? How is their trade balance? Having looked at bond yields for other reasons, I have to say my initial reaction to the Economist’s article was wrong, and Krugman’s was right. Even before Germany stepped in to give Greece aid, Greek bonds yielded 7% interest, compared with nearly 14% for Latvian bonds. I’m not sure what the bond yield spread graph the Economist’s provided is supposed to show, but it doesn’t show perceived likelihood of default. I think most can not catch the point: the reality is that Latvia can not be any evidence/example etc., because Greece, Spain etc. can not cope with GDP falls of -18%. They will disrupt as states. Latvia can be only a counterexample to internal devaluation way.